Natural forest with > 30% canopy cover, in which the canopy is predominantly (> 75%) needleleaf and evergreen. Natural forests with > 30% canopy cover, in which the canopy is predominantly (> 75%) needleleaf and deciduous. Natural forest with > 30% canopy cover, in which the canopy is composed of a more or less even mixture of needleleaf and broadleaf crowns (between 50:50% and 25:75%). Natural forests with > 30% canopy cover, the canopy being > 75% evergreen and broadleaf. Natural forests with > 30% canopy cover, in which > 75% of the canopy is deciduous and broadleaves predominate (> 75% of canopy cover). Natural forests with > 30% canopy cover, composed of trees with any mixture of leaf type and seasonality, but in which the predominant environmental characteristic is a waterlogged soil. Natural forest with > 30% canopy cover, in which the canopy is mainly composed of sclerophyllous broadleaves and is > 75% evergreen. Any forest type above that has in its interior significant areas of disturbance by people, including clearing, felling for wood extraction, anthropogenic fires, road construction, etc. 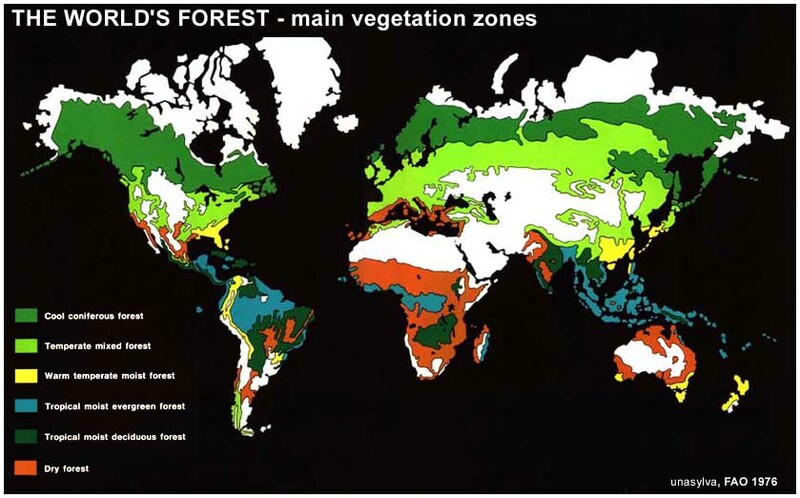 Natural forests in which the tree canopy cover is between 10-30%, such as in the steppe regions of the world. Trees of any type (e.g., needleleaf, broadleaf, palms). Intensively managed forests with > 30% canopy cover, which have been planted by people with species not naturally occurring in that country. Intensively managed forests with > 30% canopy cover, which have been planted by people with species that occur naturally in that country. Forest plantations showing extent only with no further information about their type, This data currently only refers to Ukraine. Forest data showing forest extent only with containing no further information about their type. Natural forests with > 30% canopy cover, below 1200m altitude that display little or no seasonality, the canopy being >75% evergreen broadleaf. Natural forests with > 30% canopy cover, between 1200-1800m altitude, with any seasonality regime and leaf type mixture. Natural forests with > 30% canopy cover, above 1800m altitude, with any seasonality regime and leaf type mixture. Natural forests with > 30% canopy cover, below 1200m altitude, composed of trees with any mixture of leaf type and seasonality, but in which the predominant environmental characteristic is a waterlogged soil. Natural forests with > 30% canopy cover, below 1200m altitude in which between 50-75% of the canopy is evergreen, > 75% are broadleaves, and the trees display seasonality of flowering and fruiting. Natural forests with > 30% canopy cover, below 1200m altitude, in which the canopy is composed of a more or less even mixture of needleleaf and broadleaf crowns (between 50:50% and 25:75%). Natural forest with > 30% canopy cover, below 1200m altitude, in which the canopy is predominantly (> 75%) needleleaf. Natural forests with > 30% canopy cover, composed of species of mangrove tree, generally along coasts in or near brackish or salt water. Natural forests with > 30% canopy cover, below 1200m altitude in which between 50-100% of the canopy is deciduous and broadleaves predominate (> 75% of canopy cover). Natural forests with > 30% canopy cover, below 1200m altitude, in which the canopy is mainly composed of sclerophyllous broadleaves and is > 75% evergreen. Natural forests with > 30% canopy cover, below 1200m altitude, in which the canopy is mainly composed of deciduous trees with thorns and succulent phanerophytes with thorns may be frequent. Natural forests in which the tree canopy cover is between 10-30%, such as in the savannah regions of the world. Trees of any type (e.g., needleleaf, broadleaf, palms). The Tropical Rainforest Regions: Tropical rainforests mainly occur inside the World’s equatorial regions. Tropical forests are restricted to the small land area between the latitudes 22.5° North and 22.5° South of the equator – between the Tropic of Capricorn and the Tropic of Cancer (see map). Rhett Butler in his excellent book, A Place Out of Time, refers to the regions as the Afrotropical, the Australian, the Indomalayan and the Neotropical rainforest realms. The Afrotropical Rainforest Realm: Most of the tropical rainforests of Africa exist in the Congo (Zaire) River Basin. Remnants also exist throughout Western Africa which is in a sorry state due to the plight of poverty which encourages subsistence agriculture and firewood harvesting. This realm is dry and seasonal when compared to the other realms. The outlying portions of this rainforest is steadily becoming desert. The Australian Rainforest Realm: Most of this rainforest is located in New Guinea with a very small portion of the forest in the Northeast of Australia. Actually, the Australian forest has expanded over the last 18,000 years and remains relatively untouched. The Wallace Line separates this realm from the Indomalayan realm. Biogeographer Alfred Wallace marked the channel between Bali and Lombok as the divide between two great zoogeographic regions, the Oriental and Australian. The Indomalayan Rainforest Realm: Asia’s remaining tropical rainforest is in Indonesia (on scattered islands), the Malay peninsula and Laos and Cambodia. Population pressures have dramatically decreased the original forest to scattered fragments. Southeast Asia’s rainforests are some of the oldest in the World. Studies have indicated that several have existed for over 100 million years. The Wallace Line separates this realm from the Australian realm. The Neotropical Rainforest Realm: The Amazon River Basin covers some 40% of the South American continent and dwarfs all other forests in Central and South America. The Amazon rainforest is roughly the size of the forty-eight contiguous United States. It is the largest continuous rainforest on Earth. Four-fifths of the Amazon is still intact and healthy. Logging is heavy in certain areas but there is still debate over the adverse effects. Oil and gas, cattle and agriculture are major causes of neotropical deforestation.